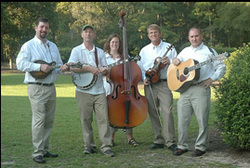 Bluegrass music has been a vital part of our heritage and culture in the Carolinas for many years now. The Charleston-based bluegrass band, YeeHaw Junction, is keeping the tradition alive and strong in South Carolina’s Lowcountry and throughout the region. Stringed instruments are the core of any traditional bluegrass band: Kristen Meierer on upright bass, Jeff Meierer on mandolin, Shayne Floyd on guitar, David Brown on fiddle and George Delporto on banjo. Their hot picking and smooth harmonizing will provide an all-acoustic treat for any bluegrass fan.